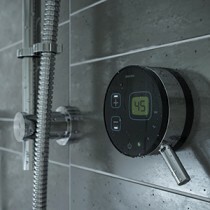 Digital Mixer Showers allow precise temperature control giving the user a great showering experience. Ceiling fed and wall fed options available in a variety of finishes. Digital Mixer Showers stylish with added functionality. Options include wired and wireless controls. Digital displays allow for the user to see exactly what temperature the shower is set to.